Dear Cindy, How hot is it today? Greetings from the Hoosier State where we've been enjoying some rather mild weather these last few weeks. And by mild I mean I don't think we got to 80F today. Even for us, that's unusual in August. How hot is it where you are, on your Corner of Katy down in Texas? You mentioned in your last bloom day post you were desperate for rain and then I saw you posted after that about getting some rain. Good for you! Good for your garden! 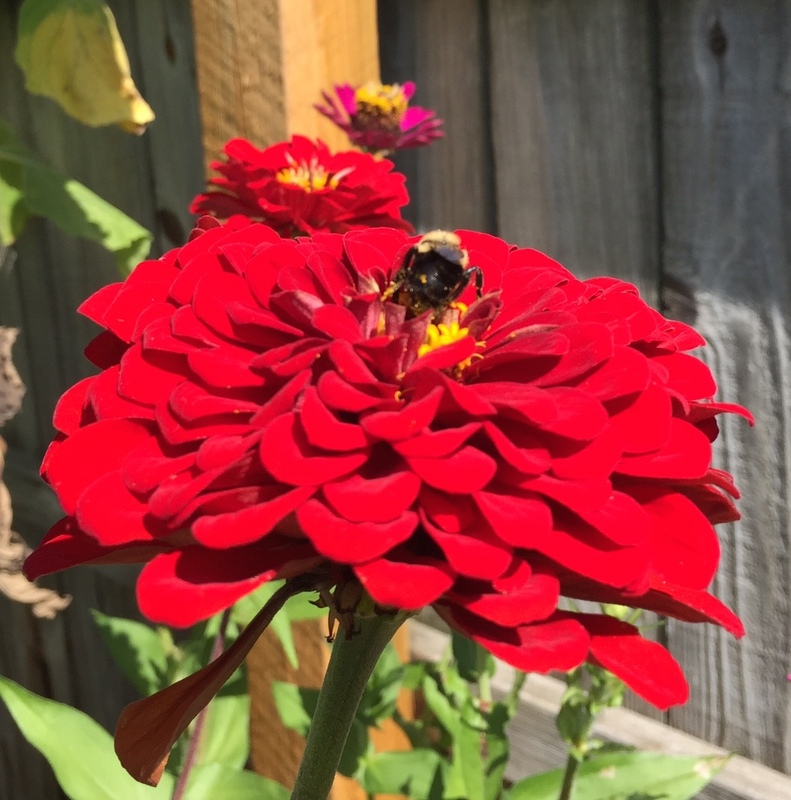 I thought of you the other day when I was taking pictures of flowers in my vegetable garden, including these red hot zinnias. That's one flower we have in common, isn't it? Or I assume you can grow zinnias because I saw some growing in Tucson a few years back. What other flowers do we have in common? Rain lilies? Yes, but I have to grow mine in a container and put them in the garage every fall. I guess you grow yours in the ground year round. Year round. That's how you seem to garden, with nary a break for the winter. Sometimes I don't know how you do it, gardening all year round. And in the heat. And with all the humidity. I've been in your part of Texas just once, on a layover at the airport. I stepped off that plane and thought it was the most humid place on earth. And hot, too. A sauna. And it isn't all that dry here. I was glad to leave before I melted into a puddle. Enough of that memory. What was I writing about? Oh yes, year round gardening. I'll admit I enjoy my rest from actual gardening, usually from early December until late February. Of course, I'm still outside some, I'm just shoveling snow whereas you are planting or pruning or doing whatever it is your garden needs in the wintertime. I admire your tenacity, too. I've read about your droughts and the heat. After living through a couple of extremely dry summers, I don't envy your conditions at all. Wait. Check that. I do envy some of them a little bit because you can grow camellias, can't you? Well, I'm trying to grow a couple of the hardiest camellias I could find. They are just whips right now, but they seem to have some good buds on them. We'll see how they like the winter time in Indiana. Anyway, I am inspired by how much you work in your garden and the joy you get from it. I can tell from the pictures on your blog how much you love your garden and enjoy not only the plants but the art you've scattered through out. I'm sure sometimes, especially when it is hot and dry, you are ready to move to a cooler climate, but then it rains, and you remember it's home for you. We share that in common, don't we? A love for our home and garden, especially since we both have stayed more or less in the area we grew up in. You probably wouldn't last through a complete winter here, and I'd pine for snow if I lived there. But as I like to end my letters, we are bonded over our love for gardening, aren't we? P.S. If you have some extra rain lily bulbs, I'd love to try growing them, but I couldn't do anything with them until spring. What would you like from my garden? I've been known to wonder aloud why the heck my ancestors settled in south central Texas instead of some more temperate spot. As far as I know, none of them came here to escape the Indiana winters! I hope the hardy camellias will make for you, as we say here in the South. I'll make a confession here: I only have 2 camellias! I know, with all the varieties of camellias that are touted for a Southern climate, you'd think I'd have more than 2. I'm just far enough south and west in the greater Houston area that I've struggled to grow camellias. My garden was once a prairie and the camellias tend to act like a Mississippi belle transplanted to New Mexico. I'll keep trying, though ... maybe we'll celebrate our success together one day! Carol, I didn't know Cindy's garden used to be a prairie! That makes so much sense now that I think about it! I don't know how she deals with the hot, humid summers, maybe she is strong like Texas bull! But, she has created a lovely garden on her corner of Katy!